As the shipment of Mika's new NRD-545 was delayed, we relied on the older tools... Below you can see Mika's NRD-535D. 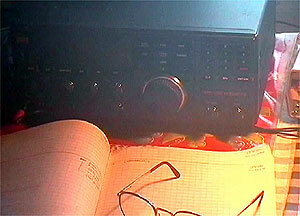 Both Mika and Jim were using two identical NRD-535D receivers. Two receivers come in handy especially when hunting stations which have local identifications relatively rarely. RAI (Italy), all Spanish networks and NHK-2 (Japan) stations are good examples of this. Additional equipment included amplifiers and antenna tuners. Both had a switchboard designed by Roland Sandberg to select the antennae, and if necessary, to split a particular antenna between the two receivers. The recording equipment also merits a note, as for the first time Mika was using a minidisc-deck (Sony MDS-JE520) replacing a vintage cassette deck. The improvement was revolutionary! Not only was the recording quality better, but the possibility to use memory in recording is exactly what a DXer needs. With this deck you can have the last 12 seconds constantly in the memory of the deck even when recording is on pause. When you hear an ID, you just switch the recording on, and the preceding 12 seconds are also recorded. No more missed IDs!